So, I've just mailed my cards for the card exchange. My husband was not as "thrilled" about it as I was. When I told him there was a touch of eye rolling of course, and some random comments about the cost of postage. I ignored him. When our first card arrived (Nigel and Bella) his response was, "I'm sure you'll show me later." When the second came (Willoughby), he glanced. I put up both on a doorway, and added a shot of our card as well. He was underwhelmed. His cousin stopped by (mid twenties, guy's guy type) and I'm in the kitchen. I hear my way too cool husband say, "Hey come in. You gotta see these cards." And he took him to see the cards and named the dogs by name as he showed them (ok, yes, they are on the cards, but still...) Later his folks stopped by and he did the same thing, once he thought I was out of earshot. I guess we now have one more of those freaky sheepdog nuts in the ranks...Good thing he's way too cool to be involved in this sheepie stuff! All that sounds very familiar indeed! traciels28; are you sure we aren't married to the same guy?!? Adam did the same thing! I was going to shoot my photos... he set up the light kit, and move all our living room furniture out of the way (so I didn't hurt myself) and then when it came time to take the pictures, he did it "to make sure there wasn't a problem". And as the cards have begun trickling in, he feigns disinterest, but I see him checking them out on the mantle!!! Glad our card arrived! I couldn't figure out how to use the machine to write on the card so I couldn't fit in Percy, Edwina and Merlin. Next year will be better! My husband wasn't so keen whenthe first few arrived last year, by the end he was comparing the sheepies and saying how lovely they all were. He even had picked a favourite! This year after the first card arrived he's asking if any more have arrived and hes already looking forward to last years favourite sheepie card!! 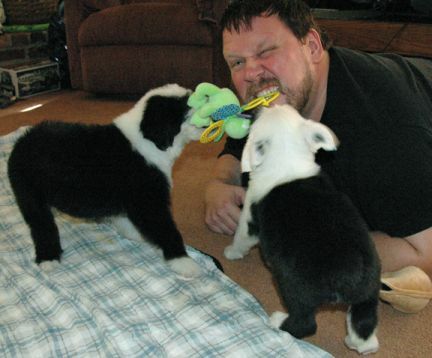 My husband doesnt even like sheepdogs,when the photo of the litter came last week he is all"So which one is it? "(Not that I care implied) and I said "they dont get assigned to us for 2 weeks,he then gets all defensive,"I hope its that one,she looks cool.Or that one.I like the markings on that ones face.Though that one is pretty,too"But he doesnt care!Doing the grocery shopping he bought my daughters dog a new purple lead and said "You really should be buying everything purple for Summer and everything pink for Kismet" and promptly went offf in search of pink dog accessories.Then he found the pup toys and started filling up the basket and I said "What are these for?" and he said "Late Christmas present for Kismet,she may not be here until early Feb but we cant leave her off the Christmas list,she will get them when she gets here". Back home he rearranged the bedroom furniture so the crate will be where Kismet can see us (him) if she wakes up at night"for safety reasons". And he has flashed her litter photo to everyone we saw on our dogwalks.Even though we dont know which one she is! But no,sadly he doesnt like sheepdogs! Yeah, they all grumble, mumble, but its all macho stuff. They think it has to be that way because thats the way they were raised. After all there is a certain role of ethics to be a GUY. here's my Mr "I don't want dogs, but I guess I don't have a choice in the matter"... doesn't he jsut look miserable? That picture is absolutely awesome. And for a second, I thought it was my husband with our two puppies way back when! Thanks for sharing it. We went into the BARN where he was running around like a madpup. BRANDON (yes, he spelled it in all caps we later learned) jumped into HIS arms, and Mr. Doghater hugged him tightly and announced, "She'll take him." This is great!! I'll add my husband too. I didnt ask him about getting Tiggy, he was away overseas for work and she miraculously became available, so I thought "this is meant to be" and brought her home. Yeah, they're all that way. I came in and found my SO wrestling with Genevieve the other night. He who thinks they're too big to play in the house. Alison - your Mr. Bibbers is as big as my Einstein! He's a big boy. 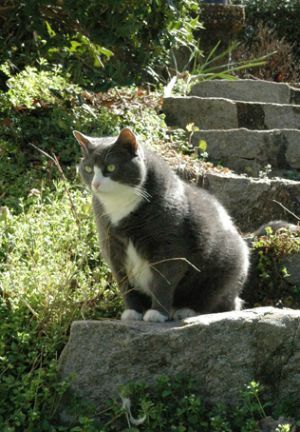 Bibbers has been a very chubby girl (14+ pounds) most of her life. She's 15 years old, and at the vet now with some fairly serious health problems. Apparently she lost alot of weight way too fast, and her liver is hurting for it. Please thinks some positive healthy thoughts her way!!! I was actually previously enagaged and my then fiance found out I was buying my first OES puppy(my dream since childhood,my money,my home,he didnt live with me),and he "banned" me from buying her,and said (famous last words)"No wife of mine is buying a dog that costs that much".Well,guess what,no wife of his did,as I promptly dumped him.I always try to think of a more reasonable explanation as to why we split up,but thats the actual truth of the matter! Great story. I'm glad you got that all straightened out before a wedding. When my (then) boyfriend "forbade" me to get a sheepie, I knew there was no way I'd live with the whole "forbidding" nonsense. This was as good a test run as any. As an aside, when I was a child, learning to read, there was a set of readers published by Ginn and the main character was Mr. Mugs. I read about that sheepie for many years and paid close attention. OF COURSE I grew up wanting an OES. I have to scan some old pictures of BRANDON (he was with us before digital cameras). He sure looks sheepie-ish to me. I'd love to hear what others think he was crossed with. The lady I got him from said his dad was a "dog." Although from his size, it's entirely possible his dad was a moose. We sure loved that forty dollar sheepie cross. (Sadly, we lost him to a very aggressive cancer at the age of six.) Still, he was a bargain at ANY price.